We here at Haruspex Games are more than in touch with our emotions. While many people have been tirelessly asking ‘when will someone make a game that makes you cry?’ for years now, we’ve have been getting down to business and welling up over videogames since the first moments we held a controller. In fact, we’d be prepared to argue that here’s nothing more enjoyable than a good cry at the right set of circumstances, and it seems those behind To The Moon understand this sentiment completely. 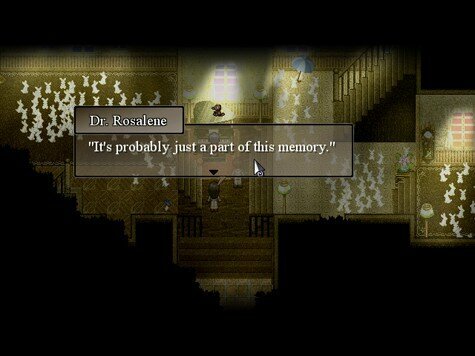 To The Moon has storytelling at its very heart. In fact, it’s not much more than storytelling, all things considered. The game follows two doctors, Neil and Eva, as they try to fulfil the final wish of a dying man. They work for a company that deals exclusively in this field – granting the dying one last wish. And this is done not by acting in the real world, but by altering the memories of the client so that they die believing their last wish was granted. in the case of Johnny, their latest assignment, he wants to go to the moon, even if he’s not sure exactly why. You control both Neil and Eva, switching between the two throughout the game, as they try to fulfil their end of the contract. In order to do so they connect a computer up to Johnny’s brain and enter his memories, going back far into his past so that they can make his desire to visit the moon take root. From there the machine will do its work and alter his memories of his entire life, making him believe that at some point, for whatever reason, he really did go to the moon. For the player, this consists in directing the two doctors around each scene, trying to find important mementos that link the current memory to the previous one. Once all these have been found you can travel back to the previous available memory, and so on and so forth back into the past. There honestly isn’t a great deal more you do throughout the game – Neil and Eva are nearly always passive observers to Johnny’s memories, and as a result you’re similarly passive. The game has a story to tell and it’s your job as the player to observe this story – not change it. But this is never a problem, because my god what a story it tells. In all my talk of crying above I may have made it seem like it’s just a tearjerker, but it’s not just that at all. It’s a smart, mature,and often very funny study of a man’s life. It’s essentially a character piece – over the four or so hours of the game’s duration you slowly come to learn a great deal about both Johnny and his recently-deceased wife River, who plays a pivotal role in the drama. So if and when you do cry it’ll be because you’re invested in the story and its characters, not because you’ve been manipulated you into doing so. And all through you’re accompanied by Neil and Eva, who are wonderfully painted characters. So much so that it’d be a massive disservice to the game to try to sum them up in an archetype or two. They act like real people, and they argue and crack jokes because they’re used to this line of work, and used to each other’s company. They grow and change throughout, and it becomes clear that their thoughts and motives are both conflicted and a sometimes contradictory. But though a great deal of your time will be spent with the two doctors, the game always revolves around Johnny’s life story. We see the difficulties in Johnny and River’s marriage, their often crippling inability to communicate, and as we move back through Johnny’s life questions are slowly answered. I don’t want to go into detail because I don’t want to ruin even a small part of what happens. I’ll just say this: it’s extremely special. It deals with everything from love to selfishness, death, mental illness, childhood trauma, and powerful moments of happiness, all with a deft touch and an honesty that’s frankly all too rare in this medium. It’s a little difficult to keep up with at times, since the story is being told in reverse and things that are referenced early on are only given meaning much later. That is, much earlier. And while its opening hour is fascinating the rest of the first act made me wonder if the game was going to hold together after all. But after this short blip the game picks up once again, grips hold of you, and doesn’t falter a second time. And as the game draws to a close everything starts to come together. You start to come to understand things that were never explained, or that seemed insignificant. The discovery of the reason behind Johnny’s desire to go to the moon was incredibly poignant, for example, and there are other points late in the story where everything – a lifetime of memories, actions, and powerful regrets – come together to wonderful effect. And I love how all this is left for the player to work out. There were things, rather important things, that I missed for quite a while, sometimes until after the game had reached an end, because I hadn’t remembered something, or because I hadn’t put two and two together. It would have been all to easy for the writer to panic and have the characters constantly explaining the significance of events to one another in an attempt to keep the player on board, but the game has the confidence to let you work things out on your own. I want to write a great deal more – about how the game deals with its themes, the initially opaque but increasingly tragic story of Johnny and River, and how it deals with the whole ‘changing people’s memories’ idea that drives the narrative. But again, I don’t want to get too in-depth in case anyone is thinking of actually playing the damn game. Maybe I’ll write something about these things in a separate piece somewhere down the line, but for now all you really need to take away is this: To The Moon is a powerful, clever game, and its story and characters are superbly written. This isn’t just great writing for a videogame – it’s great writing with no need for qualification, and I would recommend it to anyone, whether they play videogames all the time or whether they never play them at all. This entry was posted in Games Blather and tagged Freebird Games, Games of 2011, Review, To The Moon. Bookmark the permalink.